How does burning weapons point to the timing of the Gog and Magog War? In this "The Truth Will Set You Free" TWave Radio episode, Pastor Vic Batista of Miami's Calvary Chapel Aventura and I will continue our ongoing study of the Gog-Magog War found in Ezekiel 38-39. Vic Batista: Let's continue on with Ezekiel 39:9-10? Nathan Jones: That verse gives us more detail about the aftermath of this war. Bear in mind that we have this giant coalition of nations that come down to plunder and destroy Israel. God steps in and He destroys these armies and their nations. Now we get into the aftermath of what happens. "'Then those who dwell in the cities of Israel will go out and set on fire and burn the weapons, both the shields and bucklers, the bows and arrows, the javelins and spears; and they will make fires with them for seven years. They will not take wood from the field nor cut down any from the forests, because they will make fires with the weapons; and they will plunder those who plundered them, and pillage those who pillaged them,' says the Lord God." Vic Batista: So, as we get into this next portion of Scripture about the burning of the weapons, we know that there's going to take a certain amount of time to clean up after this invasion. Nathan Jones: In this war, we have an army of gargantuan size that has attacked Israel. This army is greater in size than the World War II Nazis marching across Europe. This is an army that's come against Israel from all directions. It's so massive, made up of the most powerful nations in the Middle East and including Russia. They have come to plunder and destroy Israel. So, you can imagine that they are carrying a tremendous amount of armament. Ezekiel is a guy from the BC's, so he's equating weapons from his time period like arrows, shields, javelins and spears. He doesn't understand what a tank is, a jet is, a gun is. He's listing weapons that he would understand. When the Lord destroys those armies, all their weapons are left there sitting on Israel's mountains, because this invasion is where it happens. Ezekiel says that for seven years Israel will go out they will take those weapons. Maybe they will drain the tanks of their fuel and burn the gas. Maybe some of the weapons will be wooden and they will be burned. Some have even proposed that Russian tanks are made of lignostone which is a burnable material. What the Israelis will be doing is using all this fuel and weaponry for what? We don't know. What we do know is that the Lord says that Israel will be plundering their enemies who had come to plunder them. It takes seven whole years to burn through all that fuel and all those weapons that had been left on the battlefield. Vic Batista: Because it takes seven years to burn these weapons, that's why we believe that these events transpire before the Tribulation, correct? Nathan Jones: I think there's a lot of good arguments for why this would happen just before or at the very beginning of the Tribulation. One of the main arguments for this timing is, like you said, the seven years it takes to burn the weapons. The Tribulation is seven years in length. Another result of this war is that the world will see Israel becoming a prime nation in world affairs. Russia and Islam are no longer world threats, so the whole political structure of the world changes. It will be a perfect time for the Antichrist to come in and make a treaty with Israel to protect him as he goes off and conquers the rest of the world. Then mid-way through the Tribulation, we are told that he turns his attentions back on Israel. Concerning the timing of the Gog and Magog War, there are two main trains of thought. One is that this war happens at just the beginning of the Tribulation, hence the seven years to burn the fuel. Two is there are others who argue at the midpoint of the Tribulation the Antichrist comes in and he forces many of the Jews to flee down into Jordan and the Petra area. If you've ever seen the third Indiana Jones movie, Indiana Jones was coming out of a building where the knight lived. That was Petra. That is supposedly where the Lord will keep the Jews protected during the remaining 3.5 years of the Tribulation. So, some say the Jews are not going to carry all this weaponry and fuel with them, so therefore this event has to happen 3.5 years before the Tribulation begins, giving the Tribulation 3.5 years more years before the Antichrist kicks the Jews out of their country. That is one views, and that's actually the view our founder, Dr. David Reagan, holds. The Gog and Magog war therefore could happen 3.5 years before the Tribulation, but definitely after the Rapture. Personally, I don't see why the Jews couldn't carry the weapons and fuel with them to their hideout. I could see them using the full seven years of the Tribulation to burn the fuel. Having 3.5 years between the Rapture and the Tribulation while the Lord's restraining influence has been taken off this earth allowing the people to go wild and release their passions and destroy everything, I don't know if the earth could survive 3.5 years before the Tribulation in that condition. So, I tend to think that this war happens at just the beginning or just before the Tribulation begins. Vic Batista: There are indeed certain nuances that point to a specific timing. We're not 100% of the timing, but the main point is that we do know the Church will not be here to endure the Gog and Magog War, and that can bring us some comfort. We do our best to bring the Scriptures meaning, for you have to read it in its context. When you do that, a pre-Tribulation timing kind of makes more sense. Nathan Jones: Exactly. Bible prophecy is like a 100 piece puzzle and the Lord has given us 75 pieces. We have to imagine what the final picture is going to look like because some pieces for now are missing. We can kind of fill in what the 25 other pieces are while we wait for them to be given to us by prophetic events happening. When they do occur, we can then plug them into our puzzle and see. For now, there are going to be some disagreements on the minor details, such as the timings of when these events take place. What we can agree on is when Ezekiel 38 places this invasion in the Latter Days, or the Last Days. These general timing makers always revolve around the Tribulation, so we can know when it is happening — the Tribulation. We also know God will shift His focus from the Church onto Israel, and that too is Tribulation related. We can therefore be sure that this event is Tribulation related. When exactly in relation to the Tribulation, and how many years or months or days beforehand, the Bible doesn't tell us. Vic Batista: That is why I like to encourage people to become good Bible students. Study Bible prophecy utilizing so many of the study materials out there. Get better acquainted with the whole big picture of Bible prophecy and the Bible. See how exactly events are going to line up. Sure, there are some prophecies that we are not 100% sure about, so ask the Holy Spirit to reveal the Scriptures to us. One of the things we don't want to be as Christians is divided, right? Nathan Jones: Perfectly said! You hit it dead on. Bible prophecy is secondary doctrine. There's no reason to divide the brethren over timings and whatnot. Sure, if we are talking primary doctrines, like Jesus was born of a virgin, He died and He suffered for our sins, He is both man and God, the Bible is the inerrant Word of God, the Resurrection happened, and salvation is through Christ alone — those are primary doctrines. Those are worth fighting for. But, what time the Gog and Magog War happens, well that's up for debate. I'm not going to stop talking to you if you think differently. That'd be crazy! 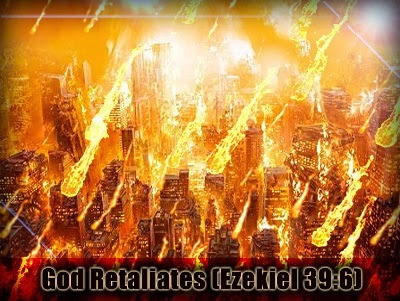 In the eighteenth segment of our study of the Gog & Magog War of Ezekiel 38-39, Vic and I will look at the massive efforts Ezekiel says will be taken to clean up the dead. Nathan Jones: Exactly. Bible prophecy is like a 100 piece puzzle and the Lord has given us 75 pieces. We have to imagine what the final picture is going to look like because some pieces for now are missing. Me: And for those of us who don't know Bible prophecy as well as those who have trained and studied exclusively for years the pieces are turned upside down. Do you not think that the clever Israelis with their advanced technological knowhow would find a way to recycle and get great profit from the raw material of that weaponry, rather than simply 'burning' as suggested? Again, Ezekiel wouldn't have been able to foresee such processes. It would be worth a fortune, after all! With the recent discovery of the massive Leviathan gas, and oil fields in their waters, Israel is potentially independent in terms of energy needs. That I'm sure is building a motive for the attack right now, don't you think? Good thought, Arabella! Ezekiel says burning, but could be the burning has other uses. The Tribulation world will be very different than our own, so it's hard to speculate accurately on the scenarios outside of the biblical text.